This blog series have been written by the winners of last year’s South London Small Grants (Innovation & Diffusion Awards). 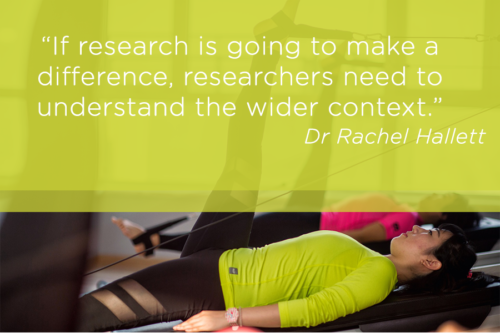 The first blog is by Dr Rachel Hallett, who is using the grant to investigate how leisure centre managers decide whether to deliver exercise programmes for people with chronic health conditions. I joined Kingston and St.George’s Joint Faculty in early 2016, as a researcher working with Professor Mike Hurley, the physiotherapist behind ESCAPE-Pain. Developed in an NHS context with physiotherapists, it can be delivered by fitness instructors in a leisure centre. There are, however, other factors in play: the leisure sector is changing, as is the NHS, with varying remits and budgetary challenges. If research is going to make a difference, researchers need to understand the wider context of delivering health interventions in the community and ensure their schemes are practical to deliver as well as effective. Mike was working hard to spread the scheme so that more people who needed it could access it. This project arose from a need to understand better how the leisure sector works, what the priorities and concerns are within it, and how schemes like ESCAPE-Pain can be beneficial for providers as well as users. Information about the Small Grants scheme was circulated by our Research Development Manager. For a small, short-term project with somewhat unpredictable outcomes, it was ideal. The project has three stages, and we’re currently at the end of Stage Two, ready to start Stage Three. 3. Follow-up interviews with some of the survey participants to explore their answers and the issues in more depth. The project has not been without challenges: these have mainly been about participant numbers. Recruitment – as with many research projects – has been difficult. Those who have participated have been generous with the information they’ve shared, so although participation is lower than we’d hoped, there is no shortage of information that will be useful for researchers to take forward. With hindsight, the initial focus on leisure centre managers should have been broader, to recognise the influencers in organisations such as social enterprises to whom local authorities have outsourced provision. Fortunately, some were included in Stage 1, as their details were passed on during the recruitment process. This meant the survey could be better targeted, and made suitable for people in a range of different roles. The impact is likely to arise after the project is complete and the findings are circulated. We already know from the survey data that leisure centre managers are interested in research and collaborations, whether or not they have already been involved. By working together, there is plenty of scope for long-term impact.